From near the Stag–Reid Creek forks (J34 380835 / BW18 280 219) follow a narrow rib up onto a tussock plateau where there is a tarn and campsites at the 1200-metre contour. Continue up the spur, deviating south at 1700 metres across a creek to a more open spur that rejoins the original spur further up. Continue over Pt 2186 metres and up to the summit. The view into the Wilkinson and up to Mt Evans is spectacular. Descend from the hut to the forks at J34 404835 / BW18 304 219, cross Stag Creek and climb out onto the ridge to the south. Follow this up to a basin at about the 1800-metre contour, then head south-east up the snow basin to the summit. 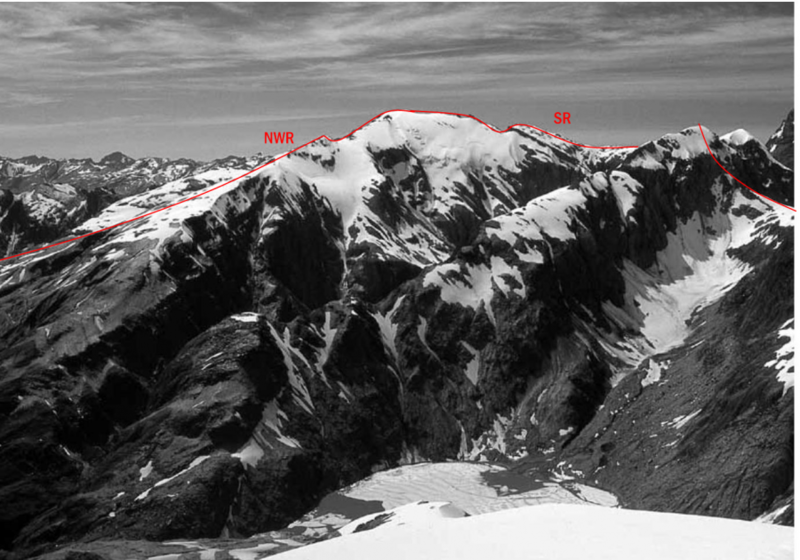 Glacial recession means some have found it necessary, due to crevasses, to sidle to the North West Ridge from just below the 1800-metre contour, reaching the ridge itself at about 2060 metres and then climbing over Pt 2186 metres to the summit. From Seddon Creek gain the East Ridge and follow snowfields and rock. The southern slopes of Park Dome have extensive crevassed snowfields with some significant buttresses of reasonablelooking rock. Gain Pt 1934 metres on the Bloomfield Range from either Reid Creek or the County, then a couloir on the County side leads eventually to Pt 2196 metres. The ridge is narrow to Pt 2216 metres, then sidle the head of the Reid Creek snow basin to overlook the McKenzie Glacier. This point can also be reached by scrambling up loose rock from McKenzie Col. Accessing McKenzie Col from either the County or the Wilkinson can be easy enough in spring snow, but both sides are subject to stone fall and schrunds can cut access from the Wilkinson. The South Ridge itself presents few problems, with a chimney providing the solution to a last line of minor bluffs.